Intertops Poker is sending another online satellite winner to a big live tournament event this weekend. This time it's Lukas W, a 28 year old civil servant from Germany, and he'll be competing in the WPT Venice. The winner will post photos and stories from Venice on the Living the Dream blog. Lukas won a $2200 WPT Prize Package that includes €990 buy-in for the WPT National Main Event plus premium hotel accommodation near the casino for him and his girlfriend. 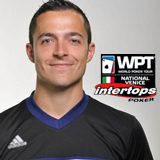 An Intertops Poker player that recently won an online satellite tournament will be at the WPT Venice this weekend. "I realized that I might win when we were 3-handed." "I eliminated one of the opponents in an all in situation KQ>K7 and won a huge pot. At the heads-up, the other player was crippled and so it was over very quick. " "I don't play lots of major events. Usually, I'm playing cash games. " "In 2013 I played a 330€ side event at the EPT Berlin and last year I won a seat at the FPS Cannes for 1.100€. I reached day 2 with only 25BB, and I busted fast without cash. Hopefully, it's time for a catch in Venice this weekend!" The €200,000 GTD WPT National Venice will be at the Casino de Venezia, the world's oldest gaming establishment, April 17th to April 20th. The game will be No Limit Texas Hold’em. Players will begin with 30,000 chips. Blind levels last 40 minutes. The prize pool will be €200,000 guaranteed. Later this month three other online satellite winners will be in the Caribbean representing Team Intertops at the $200K GTD CPPT St Maarten after winning $4100 prize packages last weekend. Intertops Poker is one of the busiest online poker rooms on the Revolution Poker Network. It regularly hosts online satellite tournaments that send winners to live tournaments all over the world. Intertops Poker players earn Frequent Player Points (FPPs) that automatically turn into Gold Chips that can be redeemed for no deposit bonuses.